» Is Virginia the Long-Awaited ‘Third Team’ in ACC Basketball? Is Virginia the Long-Awaited ‘Third Team’ in ACC Basketball? There are two kings, but where are the princes? One of the two schools has held at least a share of the ACC regular season title for the past eight seasons, and 13 of the last 15. Every year, pundits and fans wonder if a third team will emerge to challenge the duopoly, and every year the hope gets a bit weaker. But there was a time when hope wasn’t necessary. In 2001, Juan Dixon’s Maryland team jumped out to a 22-point lead on Duke in the Final Four. Shane Battier led the Blue Devils to one of the largest comebacks in NCAA tournament history, and Duke would go on to win the title. But the Terrapins had established something, and they capitalized on the promise the following season by winning the ACC regular season title and the national championship. As of 2002, there was a legitimate third team in the ACC. Then something happened to Maryland coach Gary Williams. He never lost his combustible sideline demeanor, but he did seem to lose his taste for the rigors of recruiting. Almost overnight, the Terrapins dropped off the map. And as they fell, so too did the idea of a third ACC powerhouse. The NCAA tournament record of the “others” since then is a narrative of diminishing returns, and there are precious few signs of a revival. At the moment, the hope of a third team in the ACC race is roughly as strong as the hope of a third party in the U.S. presidential race. 2004: Wake Forest loses in the Sweet 16 and Georgia Tech wins five nail-biters in a row to make the championship game in what I’m not afraid to call a total fluke. 2005: NC State loses the Sweet 16. 2006: Boston College loses in the Sweet 16. 2007: No team makes the Sweet 16. 2008: No team makes the Sweet 16. 2009: No team makes the Sweet 16. 2010: No team makes the Sweet 16. 2011: Florida State loses in the Sweet 16. If you’re looking for a conclusive statistic, it’s this: in the past five seasons, only one ACC team other than Duke or North Carolina has made the Sweet 16. That team, the Florida State Seminoles, looked as though they might be establishing themselves as a potential challenger to the throne. Leonard Hamilton has slowly built his program, and last season they had the country’s best defense. They beat Duke in Tallahassee, and would have done the same to North Carolina if not for a last-second 3 by Harrison Barnes. In the tournament, they lost in the Sweet 16 to VCU, an eventual Final Four team. But this year, the Seminoles haven’t looked as strong. They’re just 8-5 after navigating the “easy” part of the schedule, and though they still boast the 5th-best defense in the country, the offense, without Chris Singleton, has been mostly embarrassing. For the moment, at least, we can shove Florida State to the side. Instead, the team that’s emerged as the potential party-crasher is the surprising Virginia Cavaliers. Ranked 21st in the AP poll and 23rd in the ESPN/USA Today Coaches Poll, Tony Bennett’s club is 13-1 heading into conference play. And until the problem of a third great team is solved by importing Syracuse from the Big East in 2013, the Cavaliers might be the last best hope. If you’re like me, your first instinct when seeing Tony Bennett’s name is to make a bad joke about the singer. Believe me, I’ve made my share. Mostly alone, in front of the mirror, just before crying, because hey, we all have our ghosts. But Bennett is more than just an easy punch line. Did you know he’s the career leader in NCAA 3-point shooting percentage? It’s true; he compiled the insane 49.7 rate — the closest any eligible player has ever come to the mythical 50 percent — while playing for his dad at Wisconsin-Green Bay. He even won the Frances Pomeroy Naismith Award, which is given annually to the best player under 6 feet tall. Seriously. He started coaching with his dad at Wisconsin, stayed for the beginning of the Bo Ryan era, then moved to Washington State as an assistant in 2003. 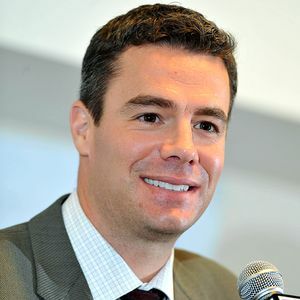 He became the head coach in 2006, and won basically every national coach of the year award in his first season. He moved to Virginia in 2009, and today, at age 42, the baby-faced Bennett in his third season with the Cavaliers. He took over a team that went 10-18 in 2008-09, and quickly began a turnaround. After last night’s win over LSU, he has his best chance yet to make the NCAA tournament and contend for the top of the ACC table. The Cavaliers are led by Mike Scott, the 6-foot-8 senior forward, and Joe Harris, a 6-foot-6 sophomore guard and Bennett’s best recruit to date. But where the team really excels is defense. Per Ken Pomeroy, they’re the 14th-most efficient defense in the country, and top 10 in defending the three and preventing offensive boards. They’ve won games by scores like 49-35 (Drexel) and suffered their only loss, to TCU, by a similar count of 57-55. Like Wisconsin, they play an absurdly slow tempo, averaging just 61.7 possessions per game. It’s no coincidence that Bennett adheres to this style after serving under Ryan at Wisconsin; he’s a protege of the slow-down guru. The shooting percentage and turnover rates are roughly a draw, but where Virginia really excelled was on the boards. The Cavaliers allowed LSU to grab an offensive rebound just 20.6 percent of the time, and, despite an aggressive man-to-man, rarely let the Tigers get to the line. The first stat is even more remarkable considering LSU is the 11th-tallest team in the country, and averages a 36.2 offensive rebound rate. How do they do it? The Cavaliers aren’t small, but they’re not huge, either. Assane Sene, a senior, is a 7-foot giant, but he only plays about half the game. After that, Scott is the only player over 6-foot-6 who averages even 20 minutes of playing time. Let’s take a look at a typical possession from last night to see how Virginia functions on defense. 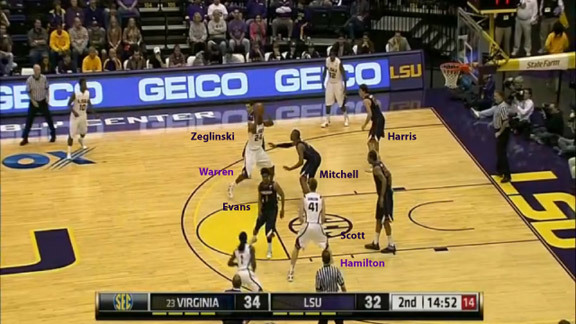 As LSU brings the ball upcourt, but still not close enough to initiate the offense, you’ll notice Scott and Akil Mitchell are fronting LSU’s post players, Storm Warren and Justin Hamilton. 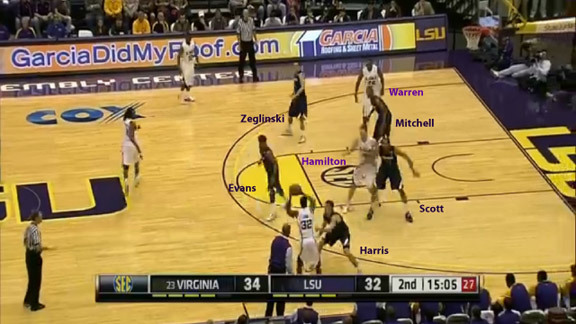 The Tigers managed just five offensive rebounds the entire game, but the 7-foot Hamilton nabbed four of them. 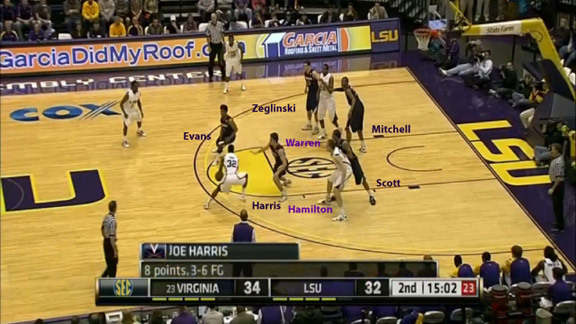 He’s also LSU’s leading scorer, and clearly the focus of the Virginia defense. The ball is entered to the right wing, and Scott, the team’s best post defender when Sene is out of the game, gets out of his position and moves to Hamilton’s left. He’s still fronting him, but he won’t be for long. If they enter the ball, Hamilton will have to go his left (his weak side) and into the middle of the defense, where help defense is waiting. 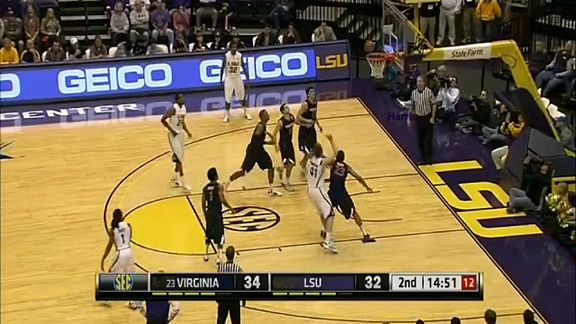 Scott’s defense stymied LSU’s attempts to pass into the post, so LSU guard John Isaac tries the middle. Virginia’s response is almost immediate, and here’s where the man-to-man takes on some of the characteristics of a zone. Harris backs down, playing off his man (Isaac rarely shoots 3s), to protect the post. Sammy Zeglinski, on the far side, backs down to stand in front of Warren. 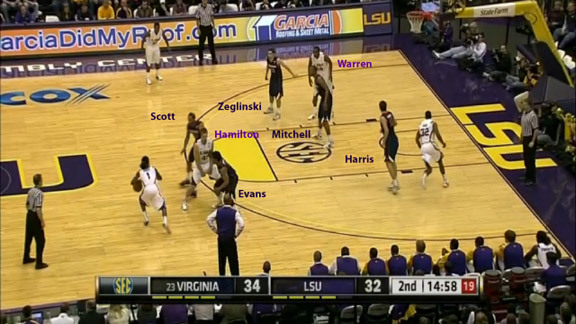 Evans, at the top of the key, has his eye on the ballhandler in case he tries to penetrate. All five players are conscious of the ball, and reacting to what the next move might be. That’s the hallmark of strong man-to-man defense — each player’s focus is total, rather than directed solely at the man he is guarding. Isaac gives it up to the point, finding nothing in the middle, and Hamilton comes to set a screen for Anthony Hickey. We’re about to see another risky move that only well-trained man-to-man defenses can pull off. It’s the high hedge, and for the second time in the possession, Scott makes a fantastic defensive play that will go mostly unnoticed. Compared to the last picture, you can see how high Hickey is forced to move before he can think about making a play. This almost single-handedly nullifies the pick-and-roll with Hamilton, who is now guarded by Jontel Evans, a man 13 inches shorter. But just in case the hedge doesn’t work, notice how Mitchell slips to the middle of the lane, ready to pick up Hamilton if he gets the ball on the roll. Again, we see how each player is conscious of the zone. Now comes the tricky part. Even with a good hedge, a team has to execute the switch-back if it hopes to maintain a defensive advantage. 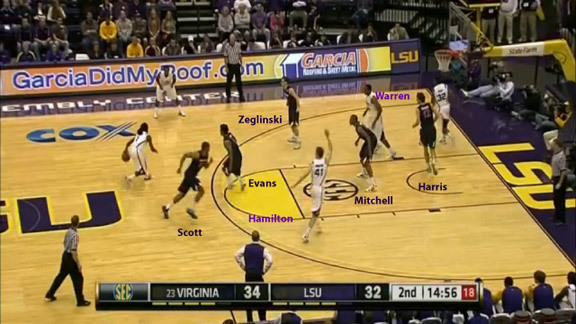 Evans can’t stay on Hamilton too long, or LSU will exploit the match-up eventually. Here, you see him leave Hamilton as he races back to Hickey, and Scott dashes back. For the moment, Hamilton has some space. Here he’s raising his hand, calling for the ball, but Mitchell is guarding two men by sneaking into the middle of the lane. 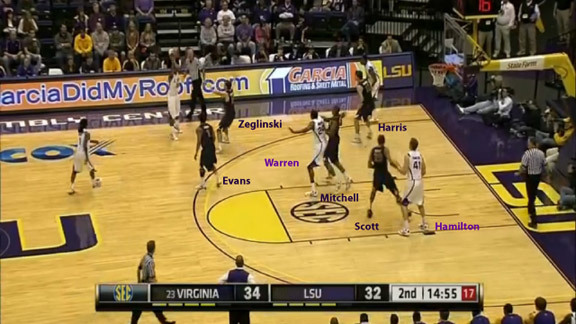 That should leave Warren open, but he’s covered by Zeglinski, a step under the 3-point line. LSU has essentially no easy options. Scott recovers to Hamilton, and Mitchell gets back on Warren. Hickey enters the ball into the wing, and Zeglinski jumps out on his man. Harris has followed his man to the corner. The team defense is perfectly in place, undisturbed by the complex switching, hedging, and helping that occurred after the high screen. Warren receives the post pass at the foul line. He’s a 46 percent shooter, but most of those points (8.0 per game) come inside. Mitchell will let him have the contested shot from there, and Bennett, on the bench, will be happy with the outcome. Especially because as you see here, there are four Cavaliers ready to attack the boards, and no Tigers are nearby. Warren shoots, and the board is almost certainly going to a Cavalier. 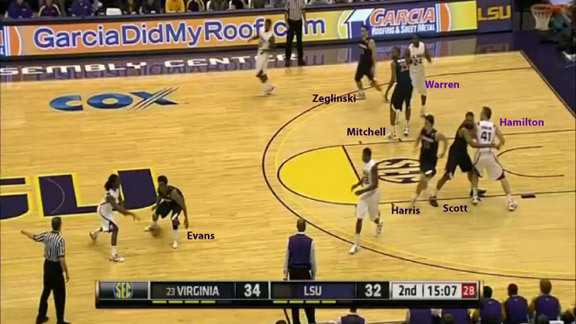 Everyone but Evans crashes the boards, which is a sign that the fast break is not a Virginia priority. 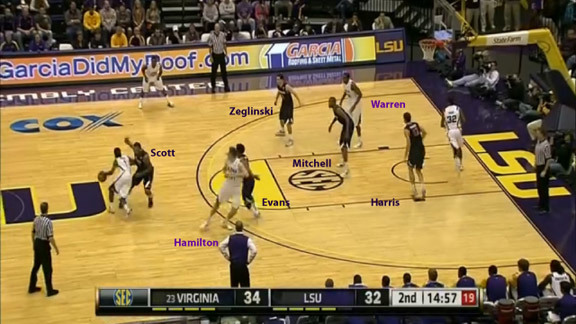 Hamilton is squarely on Scott’s hip, where he stayed most of the game. If you just follow Scott’s movements on this possession, you can see his value. The only way this board’s not going to a Cavalier is if Warren makes the shot. The whole sequence is so efficient that it’s almost virtuosic. But Warren does make the shot. Basketball isn’t perfect. Still, you see how Virginia is trained, like Wisconsin, to win the war of attrition over time. This was an example of spectacular team defense, and it’s the reason why Virginia could bide its time and finally pull ahead for good in the tense final minutes, when execution is everything. But will the slow, tough approach fly in the ACC? After a home game against Miami this Saturday, the Cavaliers will have one of their toughest tests of the season the following Thursday at Duke. In a game they seem destined to lose, the Cavaliers can still make an important point at Cameron Indoor Stadium. With a strong showing, they’ll take another step toward breaching that immutable two-team syndicate at the top of the conference. A blowout loss, on the other hand, will indicate that we’re witnessing another false alarm, so we should just relax and wait for Syracuse.